The versatile TraffiStar S350 can be used for speed monitoring in a wide range of applications. The speed of multiple vehicles and lanes can be monitored simultaneously with the TraffiStar S350. Using the latest laser technology, you can assign measurement results to all the relevant vehicles. The TraffiStar S350 works completely automatically — there is no need for an operator to monitor the equipment operation. The practical plug-and-play technology gives you the flexibility to use the speed measurement unit to measure speed anywhere and in whatever way you want — as a mobile unit using a tripod, in a vehicle or in a stationary outer housing. In this way, you can use the same measuring system efficiently at multiple locations and for different types of application. You reduce costs while increasing traffic safety at different enforcement sites. The laser measuring system differentiates between cars, trucks and motorcycles. Using this feature enables you to monitor the different speed limits that you have set for different vehicle classes and lanes. For flexible operation, you can set alternative speed limits for several time windows per day. The system also offers blocking times in which it stores statistical data but does not take photos. Thanks to the simple operating and setup concept, measuring can be started without lengthy setup times. The system is operated with an outdoor tablet PC via a WLAN interface. The operating program is extremely simple and clear and has many additional features such as a data archive, statistics and more. 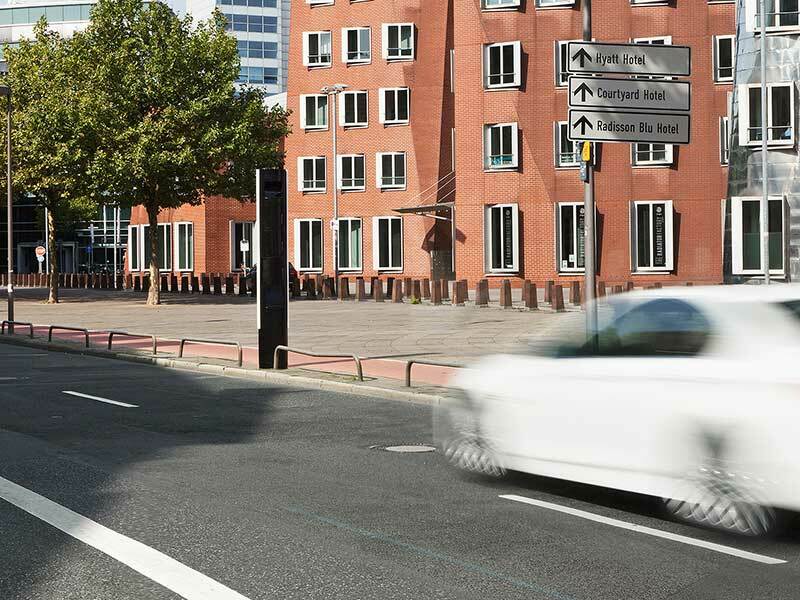 The speed violations are documented in a way that can be used as evidence by a high-resolution SmartCamera. Versatile: Alternative speed limits for several time windows per day. Accurate: Assign measurement results to individual vehicle classes. Flexible: System can be used on a tripod, in a vehicle or in an outer housing. Non-invasive: No interference with the road is necessary. Suitable as evidence: The measured value, assignment to the vehicle and the associated photo are documented in full and stored in encrypted form. Simple: It cannot be set up incorrectly and there is no need to monitor the measurement operation. Speed monitoring: Take measurements wherever you need to reduce the risk and increase traffic safety. The TraffiTower features an award-winning design and provides your speed or red light enforcement system with secure protection. TraffiNet monitoring software connects all traffic safety systems together via a remote network to make your enforcement system more effective.